While making breakfast for two, I thought about how much my daily life had changed this half a month. I used to live in a poor tenement house downtown but now I have opened an apothecary of my dreams, a Princess who was a former companion came barging in to live together with me and I’m currently making breakfast for two in the kitchen of my own home. If I were to be asked if I foresaw this future, I could only reply that I totally didn’t. I imagined a future of fighting the Demon Lord together with the Hero Ruti, a future of protecting the peace in the Imperial City as the Vice-captain of the Bahamut Knights, a future of becoming a noble and gaining a modest territory around the village I was born in … I never imagined that I would settle down in the remote region of Zoltan as an owner of an apothecary shop along with a Princess. I placed the two person’s share of food on the plates. Lit who was woken up by the smell staggered over with a sleepy look. Having Lit who says that with a grin here quickly makes my day. I finished all my shopping while we were out yesterday. In other words, today the plan was. Red Drug, that sounds terrible. Lit replied to my light jest with a crafty smile and I also smiled back. I’ll honestly depend on her here. As the number one adventurer in Zoltan, Lit has a lot of influence. It’s not like I allocated points to the negotiation-type skills to put on airs just because I don’t have any unique skills. Or rather, it didn’t seem like there was even room for negotiation. The person in charge of giving the approval for medicine was Dan, a middle-aged bureaucrat with a potbelly working in the parliament. Perhaps he was tired because his face looked haggard even though he was fat and there were eyebags under his eyes. That man welcomed us while openly displaying his feelings with his expression that it was troublesome until he received the introduction letter Lit obtained from her higher official acquaintance. However, the moment I entered the main topic on medicine, his attitude drastically changed. We could tell that the reason for his sudden change in attitude was not us. Since his attitude changed only when we asked for permission for the medicine. That was easily deduced but the essential question was why was he rejecting us. I didn’t anticipate that something like this would happen so I didn’t gather any information about this man called Dan. It was a situation where I had no means to approach the negotiation. It was probably true that a lot of my instincts had dulled because I have only been gathering medicinal plants every day. The skill granted by Divine Protection won’t decrease but it will be dulled if a person does not use it with their own judgment. It’s pathetic that I wasted the introduction letter Lit went through the trouble to get for me. We had no choice but to leave the reception office. Lit was outraged. In actual fact, halfway through I had to hold onto her when she started spilling out murderous intent. If I didn’t restrain her and if I didn’t say beforehand that I would do the negotiation, Lit might have resorted to getting the approval by means of intimidation. She was originally a Princess so she’s the type that is bad at restraining herself in negotiations. We’ll have to start by investigating the reason why he rejected us. Of course, it won’t take much time to investigate but … I quit adventuring for reasons like this so it was seriously bothersome. I have Lit here. In this situation, we’ll be using her title of being the number one adventurer in Zoltan. The chief of the department that handled the law and regulations regarding commerce and industry relations was a man approaching elderly age with gray hair. He showed a friendly grin and seemed happy that Lit came to visit. There wasn’t a need to reveal my D-rank Adventurer identity there. I gave a vague smile and shook the hand that was extended towards me. The chief continued after seeing Lit and I nod. Even though I prepared my medicine myself, I would have heard about a new medicine from Doctor Newman or the other doctors. I see. I was displeased with that fat person-in-charge just now but now I pitied him a little. It was most likely a terrible experience. I’ll gift him some stomach medicine the next time I see him. We unexpectedly got approval easily. Lit’s influence was huge after all. … Even though I was aware of it, it still felt a little depressing. Despite taking charge in negotiations during the journey, now I was made painfully aware that it won’t go so smoothly without the title of being the Hero’s companion. After that, I showed him the documents regarding the medicine and he issued the permit to us after confirming that there weren’t any problems. I could now legally sell my medicine without any issues. Leaving the parliament, I walked with my shoulders slightly slumped. I ended up relying on Lit even though I said that I would handle the negotiations. I felt a little disappointed with myself. Lit who was walking ahead of me turned around and shook her head. I inadvertently stopped walking because of her straightforward show of affection. Lit also stopped and we faced each other. Asking her why she would go that far would be pretty insensitive. The happy smile on Lit’s face caused a smile to form on my face as well. So that guy was just being overcautious? Meh, it made the SS RedxLit stronger! We do have to remember that he doesn’t want to draw attention to himself. Guess even the FDA would get criticized over a mistake like that let alone a small official. 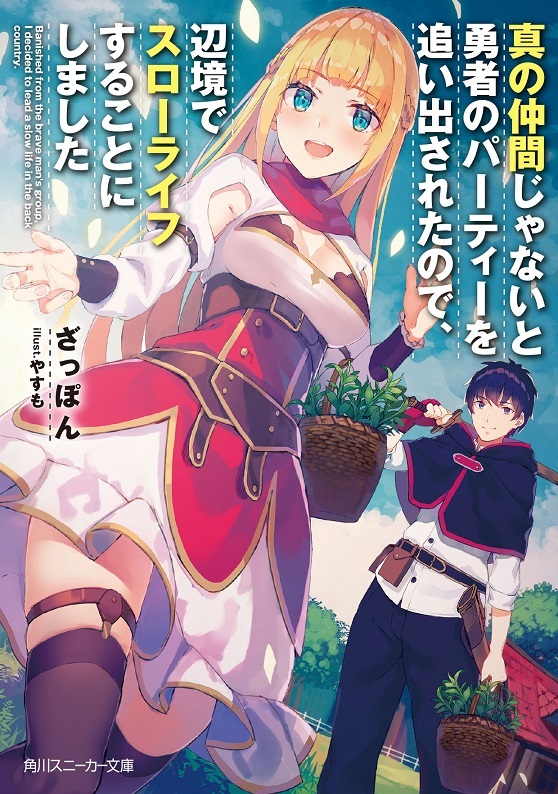 Is that this WN’s LN cover… ? She hides her face at times as well. At least she is when she is first introduced. Though they probably have, and failed. I am expecting someone to try and beat up Red for “stealing Lit from them”. That sounds like an incredibly bad idea, and not just because of how Lit will respond. Although Red was “weak” enough to be driven out of the hero’s party, the fact remains that he was strong enough to be *in* the party at all – and longer than Lit, for that matter. While his skills may have dulled, I have little doubt he can handle even A rank threats if Lit let him borrow her weapon. But considering he is trying to hide his past, and the author seems willing to let him, then I cannot see such a confrontation occurring, as repelling such a person would possibly reveal his real strength. At least in town; if the confrontation occurred while gathering herbs or similar, I can see such happening. And also a Thank You to the TL for the chapter. Looks like shes zelda from botw or skyward sword. She is a princess living alone. She probably doesn’t know how to make complicated haircuts on her own, as royalty *usually* have servants. I am disappointed Red look so generic late tens to early twenties. I was expecting him to be older. Also ads are burning my CPU. Let’s time-plot for a minute, then. Given: Gideon was 18 when the hero party set off. Given: Gideon saved his sister in the forest when he was 7, so his sister must’ve been at least 11 when the hero party was created. Given: The Hero is still small in stature according to Danan’s POV chapter. Speculation: The Hero is probably still in her teens (not fully grown). Speculation: About 4 years is the maximum amount of time that’s passed since the hero party was formed. Conclusion: Gideon/Red is probably in his early twenties. Red is plagued with MC syndrome..
Lit is the princess, she has a major advantage. Only the childhood crush should be more favoured then her. Yup it will not gonna be long for them to get married..
lol he’s not interested in her! He’s a *guide*, a bonafide good guy who thinks of others before himself. I dub the ship Red Light District. That sounds like the name of a harem ship. I was kinda expecting Lit to have a more Aladdin type look since I thought she was from a desert kingdom, I must have skimmed her character description pretty shallowly. She looks nice, but eh. Anyone can tell me in which chapter they will have, you know, willy wiggling in and out? I’m just dying to know whether they will do it or not before that imouto found him. Previous chapter button goes to chapter 12, rather than 13. Ahh~ so wholesome and nice. Also screw Ares. This joke fell apart after I realized how little political knowledge I had. ohh, come on, Red, be a man. Come and ask for Margaret on ‘Growht Cheat’.